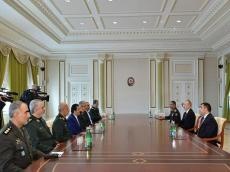 President of Azerbaijan Ilham Aliyev has received a delegation led by Chief of the General Staff of the Armed Forces of the Islamic Republic of Iran, Major General Mohammad Bagheri. The president said the Azerbaijan-Iran bilateral relations have been developing successfully in all fields over the past years, including in the military area. Saying the bilateral political ties reached a high level, President Aliyev pointed out that holding more than 10 meetings at the level of presidents over the past years played a special role in developing the relations. The president stressed the importance of reciprocal visits at other levels in terms of expanding the relations. Noting that the two countries' peoples have lived in an environment of good neighborliness for centuries, President Aliyev expressed confidence that Azerbaijan-Iran friendship and brotherhood will continue to develop successfully. Chief of the General Staff of the Armed Forces of the Islamic Republic of Iran Mohammad Bagheri extended President Hassan Rouhani's greetings to President Aliyev. Mohammad Bagheri underlined that the Supreme Leader of Iran considers it necessary to further strengthen relations between the two countries and peoples. He noted that the Iranian people are happy for the development, peace and stability ensured in Azerbaijan under the leadership of President Aliyev. Mohammad Bagheri said that the two countries' peoples have been bound together by common history and culture for centuries, and stressed that the bilateral ties are developing successfully. President Aliyev asked Mohammad Bagheri to extend his gratitude to the Iranian leadership for this fraternal position, adding that Azerbaijan hails Iran's fair stance. The president informed Mohammad Bagheri about the destruction by Armenians of Azerbaijan's historical and religious monuments in the occupied territories. The president thanked for President Rouhani’s greetings and asked Mohammad Bagheri to extend his greetings to the Iranian president.